Innokin posts the Innokin LiftBox Bastion Mod recentlly. It is designed for style and convenience. What’s more, it is the first vaporizer upgraded with the LIFT Siphon system. LIFT Siphone system means a squonking mod which carries a supply of E-liquid that feeds the dripper on the RDA. This means you don’t need to keep stopping and adding liquid to your dripper RDA and it would keep the RDA coil supplied with liquid. The siphon system on the Innokin LiftBox Bastion Mod has an 8ml capacity which is similar to most squonking box mods. 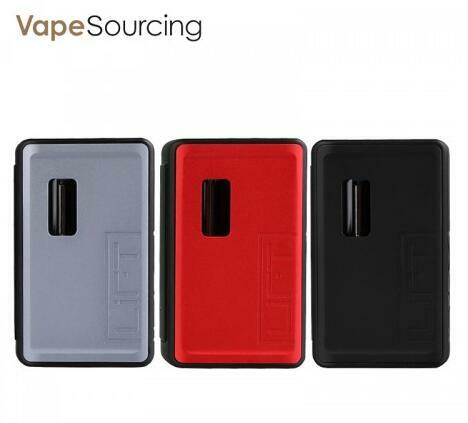 Innokin LiftBox Bastion Box Mod isn’t full-on mechanical mod as it does have some electrical safety features including reverse polarity protection, short circuits, and 0.08ohm minimum resistance so this should feel safe to mech mod newbies. First, fill the internal glass tank simply, attach an RDA with a bottom feed pin, prime the coils, squeeze the side-firing button. Secondly, Power up your coils with the LIFTBOX’s unregulated 80W/4.2 volt maximum output and enjoy the freedom to create unique vaping experiences from 0.1Ω and above builds. The LIFTBOX is powered by a replaceable 18650 battery that can be charged via micro-USB, or with an external charger, and the LED shows the remaining power level. It features a replaceable side panel and durable carbon fiber side finish, the LIFTBOX is an advanced compact vaporizer that delivers power and convenience. Safe vaping is a priority and the LIFTBOX incorporates battery safety protections including short circuit, low voltage, reverse polarity and a 0.08Ω cut-off. Where to buy Innokin LiftBox Bastion Mod?